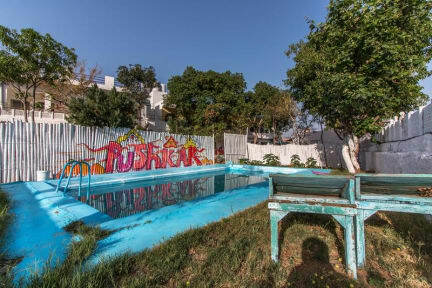 Backpacker Panda Chand Palace i Pushkar, Indien: Reservér nu! 'Backpacker Panda Chand Palace, a leisurely abode for backpackers in Pushkar, is set amidst heavenly Aravali hills. This comfortable and affordable hostel is situated in this enchanting town. 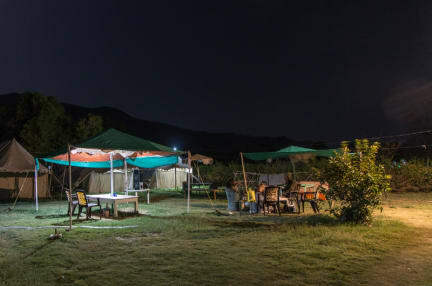 This dream place for backpackers is like a small resort, with a lot of open space surrounded by plenty of greenery, which is just 1.4 Km from the Pushkar lake and approximately 2.3 Km from the main Bramha temple. The hostel is located very close to the main market, which is barely a 15 minutes walk. The accommodation is equipped with all modern facilities, such as a mini kitchen, a separate games room, free Wi-Fi, free city maps, guest computer, hot shower, washing machine, round the clock travel desk, attached washrooms, a restaurant, a swimming pool, on call doctor etc.